This paper examines how variable output and profit share jointly determine investment and saving, while the difference between investment and saving determines the changes in output and profit share. Analysis of the resulting pair of differential equations yields novel implications for the multiplier process. In this more general framework a number of separate strands of the Keynesian inspired literature can be understood. 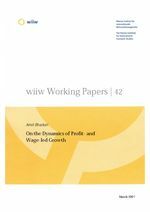 In particular the model incorporating both forced saving and profit squeeze analyses stability of the dynamical system to bring out the complex relation between in- and out-of-equilibrium profit- and wage-led regimes.